Harry Posner was certainly the right choice as Poet Laureate for Dufferin County. Full disclosure, he is prepared to go again if they ask him and here’s hoping they will, for Mr. Posner has fulfilled, and more, his ancient post’s expectations. He has written verses about occasions. More to the point, he has visited schools to do poetry workshops with students, and, bringing it out of the dusty realms into which (misguided) current curriculum is directing studies away from the arts, back into the light, he has shown students the joy and fun of poetry. He has done a number of workshops at the libraries about poetry, demonstrating the art of reading it and of writing it. He has given presentations at the Probus Club. 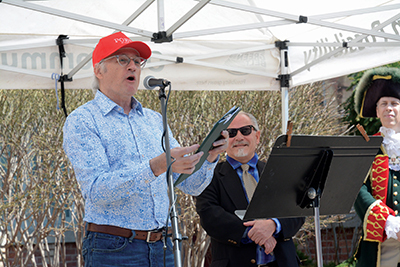 His piece de resistance, however, is his Day of the Poets, staged throughout Orangeville, last Saturday, May 5. He was pleased to tell us in a recent interview, “The day went swimmingly. It was a perfect day with the tent. There was outdoor poetry, it was so beautiful with the poets outdoors on sunny Broadway. “There were four venues and all the poets showed up, 20 of them, plus the Town Crier. The festival inevitably incurred some costs and, as Mr Posner explored ways in which to cover them, he began to cover them. The League of Canadian Poets funded the event inasmuch as Mr. Posner was determined to “recompense the poets for their travel expenses and time. Poets,” he said, “rarely get recompensed at all. So, the $1,000 from the League helped with that. He was happy to report that In the Hills Magazine was on deck to write about it, Pete Patterson there to take the perfect photos. The post of Poet Laureate can be traced back to the ancient Greeks who made a crown of laurel leaves to honour for poets and heroes. It has had a varying life since those long ago times, arriving even here in a well meant shadow of the days when poets and heroes were celebrated in the same ceremony.